SKU: 703447031896 Categories: Protein Food, Cereal Tags: Best Sellers, Ready to Enjoy! Bari Life Cinnamon Vanilla Protein Cereal is a ready-to-eat breakfast cereal that’s sweet but sugar-free and high protein! There’s no reason to eat Cheerios when you can get 15 grams of filling protein and only 120 calories from one serving. 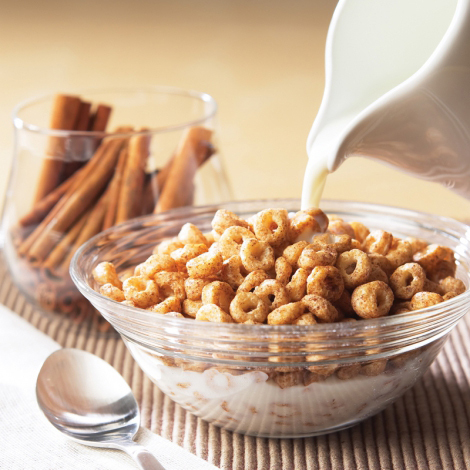 Our Cinnamon Vanilla Protein Cereal will get you ready to lose weight and feel great today. Have it with milk or yogurt, or use it as a crunchy, guilt-free high-protein snack. Crunchy and delicious, this wholesome cereal provides a high protein, low carb, low fat breakfast with 15 grams of high quality soy protein! This is an excellent choice for people who are trying to lose weight or maintain weight loss. The individual serving packs make it easy to grab and go on a busy day. Since Bari Life protein cereal was originally created for medical weight loss diets they make for a fantastic breakfast or snack option for anyone watching their weight! Enjoy them as a snack on the go, a quick and easy breakfast with milk or a late night snack when a bowl of cereal is calling out to you! Also, a top protein packed option for athletes and overall healthy living. For guidance on how to use this item as part of a healthy weight loss plan click here view our Bariatric Diet Plan. Soy Protein Isolate, Soy Flour, Soy Concentrate, White Rice Flour, Sunflower Oil, Polydextrose, Cinnamon, Sucralose, Vanilla. A 1/2 cup skim milk contributes an additional 40 calories, 65mg sodium, 200mg potassium, 6g total carbohydrates (6g sugars) and 4g protein. I was surprised at how the cinnamon/vanilla came through in a strong way. By strong, I mean that in a good way. Often high protein foods say they are going to taste a certain way and don’t deliver. This cereal delivers. I had one packet with 4 oz of Fair Life milk and by the end of eating I felt satisfied to even a little full. I’m 5.5 months out from surgery. I ordered some of these items, even though I can now eat whatever I want because I wanted some crunchy carbs, but didn’t want to waste my time eating regular carbs that wouldn’t give me enough protein. This gives me crunch, flavor, protein and I feel satisfied. It’s a win-win for me. I missed eating cereal as part of my new diet, but this cereal is delicious and now I am not missing a thing! Both the vanilla and cocoa cereals are satisfying by themselves. I learned by combining them and then making two separate pouches, they’re even tastier.